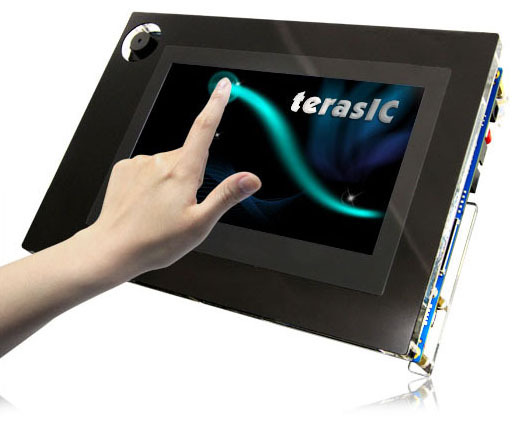 The Video and Embedded Evaluation Kit - Multi-touch (VEEK-MT) is a comprehensive design environment with everything embedded developers need to create processing-based systems. VEEK-MT delivers an integrated platform that includes hardware, design tools, intellectual property (IP) and reference designs for developing embedded software and hardware platform in a wide range of applications. The fully integrated kit allows developers to rapidly customize their processor and IP to best suit their specific application. The VEEK-MT features the DE2-115 development board targeting the Cyclone IV E FPGA, as well as a capacitive LCD multimedia color touch panel which natively supports multi-touch gestures. A 5-megapixel digital image sensor, ambient light sensor, and 3-axis accelerometer make up the rich feature-set.